This summer, the Our Lady of Lourdes Youth Ministry will be participating in the Manus Christi Appalachian Work Camp. For those unfamiliar with the concept, work camps are a week of service where we set aside time to help those in need, surrounded by other youth in an environment of both faith and fun. 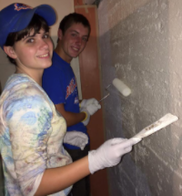 During work camp you will spend your days helping out at a ministry site and your evenings hanging out playing games with the other youth as well as spending time at mass, in prayer, and learning about the social teaching of the Church. ​This year our camp will be immediately followed by the Steubenville Youth Conference, held on the campus of Franciscan University in Steubenville, Ohio. The Steubenville Conference is a national gathering of Catholic youth coming together for a weekend of prayer, praise, and celebrating the joy and richness of our faith! If you are interested in participating in this year's camp and conference, please see all the information below! Spots for this year's trip are limited and will be given out on a first come, first serve basis! I hope you will seriously consider taking part in this great opportunity to serve Christ in our brothers and sisters! Why: Because Jesus asked us to serve those in need. In the Gospel of Matthew, Jesus says, "Amen I say to you, whatever you did for one of these least of mine, you did for me." So this is one way we can respond to Christ in love by serving our brothers and sisters in need. What: A week of service, prayer, and fun, followed by attendance at the Steubenville National Youth Conference. All the information about the Manus Christi work camp can be found at their website here. More information about the Steubenville Conference can be found at their website here. Where: Sunday through Friday will take place in Huttonsville, VA. We will be staying at the Manus Christi camp headquarters, located in the Bishop Hodges Pastoral Center of the Diocese of Wheeling-Charleston. Friday through the following Sunday will take place in Steubenville, Ohio and we will be staying in the student residences of the Franciscan University of Steubenville. Who: All current 8th -11th grade students (i.e. students who will be entering high school, 9th-12th grade, in the Fall of 2019). For the work camp: During the days, you will be serving at a ministry site helping those in need. What ministry sites exactly are to be determined, and groups may rotate through several projects depending on the size of the project and the size of the group. The Manus Christi work camp has a strong focus on contruction and renovation projects.During the evenings you will split your time between socializing, engaging in prayer and worship, and learning about Catholic Social Teaching. The Manus Christi camp is located a the Bishop Hodges Pastoral Center, which just happens to have a high ropes course and a pool with water slides which will be at the disposal of campers during various parts of the week. For the conference: The Steubenville Youth Conferece is a national event attended by almost 2000 Catholic teens from all across the nation. The focus of the event are the keynote speakers, break-out sessions, and prayer and worship. Additionally, plenty of time is given for socializing and building community. Cost: The short answer is $375. A $50 deposit is needed to reserve a space on the trip. Because of the combined nature of this trip (work camp + conference) the full cost of the program is $550. Thanks to generous support from our parishioner, the parish is covering 1/3 of that cost ($175), and we are thus asking families to contribute what they are able to of the remaining balance ($375; $325, after the deposit). However, please do not let the fee bar you from participating - additional need based assistance is available, and if you are specifically concerned about the cost of the program, please contact me directly. How do I register? Call or e-mail Mr. Cottam to reserve a spot in the program. Our 10 camper spots will be assigned on a first come, first serve basis (with a slight preference being given to older students). Once your spot is confirmed, he will follow up with you about completing the registration paperwork and turning in your $50 deposit. Do you need any help? We do need one additional female adult chaperone (over the age of 21, capable of driving), so if you applies to you and you'd like to join us, please let me know! The parish covers the full cost for adult chaperones. We will also need two high occupancy vehicles (7-10 seats) for the duration of work camp, so if you have a vehicle you think we can use then please let me know about that as well!